I'm posting from a hotel room in Bellingham, having had a day being bored in airports and airplanes. Shortly I'll be going to a gathering of Web Services people, which hopefully will entertain. Emma gave me the best send-off this morning. She and Sam were being herded out the door by Jamie to go to school. Suddenly Emma rushed back in, lips puckering for a kiss. With a kiss and an "I love you daddy," I was on my way. I have just learned the amazing skill of editing wikis. I haven't learned a new skill in ages (well, since I learned how to use imovie a year or so ago). My skin feels raw and my eyes are still sensitive to the light from being immersed in nerd language. I think I'm going to get my whole office to start using a wiki to organize our office's information, and I'm beefing up a very new Campus Compact wiki. My style is not Wikipedia-perfect, but there's something satisfying about contributing to a community where putting information out there is more important than having it be perfect. If information is a collective work in progress, it makes so much sense to be bold! Seraph, learned Mandarin Chinese yet? Just wanted to let everyone know I leave for Hong Kong and Singapore 5/15, and will return 5/25. If you have any requests for knock-off watches or handbags let me know! If any of you want to visit Robbie and Isabell, I'm sure they'd love company! The weekend has come and gone. Soon I'll be headed out to the airport for a few days of business travel. Emma gave me a big kiss farewell and Jamie took the kids to school. The weekend seemed quite busy, especially for Jamie. Her dad and Darrel came over to deliver a new bed frame to us. Then the two of them stayed glued to the television all day watching football. I seemed to spend a lot of time with the kids, starting with taking Emma swimming Friday night and going to soccer practice Sunday evening. I wasn't watching them the whole time, though it seemed that way on occasion. Fortunately they're good kids. It's Mocha Friday, though the last of that delicious elixir is long gone. Work is pretty busy as usual, with lots of little things vying for my attention. 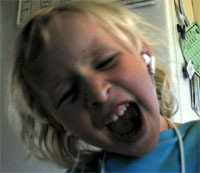 Emma was having fun with Jamie's iPod last night, rocking around the house. We spent a lot of time together last night, playing soccer in the back yard, examining our garden, and playing with Flubber. 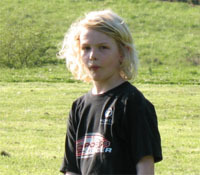 Sam was a little sick, perhaps from allergies, and didn't go to soccer. Today he's staying home from school too. Hopefully everyone's feeling better for swimming tonight, as we haven't gone for awhile. Sam has a game Saturday, which I'll probably take the kids to. Saturday night Jamie has tons of social events, so I'll try to do something fun with the kids. Next week I'm out of town on business. I'm not particularly happy about it, but that's the way it goes. For some reason, people at work feel it's useful to all get together a couple times a year. Group hugs or something. Congratulations Josh & Jody!! I can't waite to see pictures of little Rob. We have a new family member! Rob Kekoa Marvit was born today...April 25 at approximately 2 PM Hawaii time. He was 7'14oz, 19'and doing well. Jodie was 1 day earlier than her due date with a nine hour labor.She said she couldn't have done the delivery without Josh, who was very helpful. She described Rob as having a little pointy head from the delivery but adorable. He was only 3 hours old when I spoke to them....they are happy and getting their last good night sleep for many years! I'll keep you posted and will send photos once they arrive via email! Sam's funny. We just finished the game Rayman's Raving Rabbids for the Wii, which was quite an amusing experience. 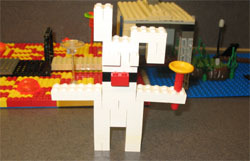 Sam got it in his head to make a Lego version of a Rabbid, which looks just like a rabbit except crazy. Plus a plunger. Sam's poor lip got whacked pretty hard at school the other day. 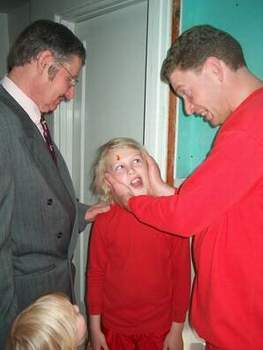 The story behind the injury was complicated, involving another kid wearing stilts. He looked pretty horrific for a day, but now the swelling is greatly reduced. It's hard to believe that it's Wednesday already. Life seems to blur by sometimes. 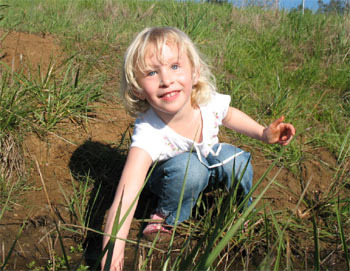 Sam had soccer practice last night, and Emma was out catching tadpoles as usual. She was pretty tuckered out, falling asleep in the car on the drive back. The kids have had a bit of a rough week. Emma had growing pains for a couple nights, coming to our bed with her legs hurting badly. Last night she slept in her bed the whole night, which is a good sign. Sam got hit by a kid on stilts at school, making his lip swell right up. It looks almost normal now, but it was pretty ugly for a day. I recently found a gray hair. 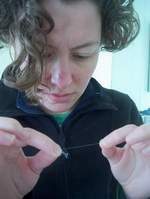 Actually, I found many gray hairs in my head, and pulled this one out for further observation and reflection. I am curious if 25 is when this sort of thing starts to happen, or if I have just been pretending to be older than I really am for so long that it's caught up with me. I've become older than I really am. Last week I drove to Providence, Rhode Island, where I was offered, and took, the national Campus Compact VISTA Leader position. Moving to Providence will be a bit of a shock, but I'm very excited by the possibilities the position affords. And, much to the relief of mom, it's only a one-year position, so I'll be in grad school and on my way home soon. I've been quite busy with work, but able to appreciate the rapid shift toward spring this weekend. I actually slept with the windows open last night, quite the change from last week's sleet and rain. Tonight is also my favorite community event all season, the Northern Berkshire Neighbors Community Recognition Awards, where everyone who is nominated wins. I always get roped into going and shaking the mayor's hand, and he always seems uncomfortable smiling that much. And I love standing next to people that are being recognized for mowing their lawns really well. We had a nice weekend, and after a few weeks of craziness are settling back to normal. Friday was a major deadline at work, so the week was full on 12-14 hours days. Robbie and Isa were left orphans, but managed to only order out dinner one night! Friday night I was out with co-workers and some venders schmoozing and celebrating. I'm to old to party hard, but it was fun to go out and cut loose a little. Saturday morning we all stayed in our PJs and watched cartoons. We headed off to see The Last Mimsey (good movie) and do some shopping. I made some pizza and we invited some friends over. The kids ran around, while the grown-up actually had real conversation! Sunday was low key. After church Robbie went to the down town library, and Isa and I went out to one of the Sauvy Island farm markets. In celebration on Earth Day we made soup from local leeks and potatoes, and had numerous other fresh veggies. Now were back to Monday, and I have a weeks worth of ignored e-mails to catch up on! Love to all - we miss everyone. The weekend is slowly drawing to a close. It was pleasant and low-key, with very little important things happening. Emma was sick on Friday and so we opted not to go swimming, instead hanging out at home and taking it easy. She felt better Saturday and we went to the library together. It's always a treat taking Emma anywhere and everyone always smiles at her. We returned to show off our loot, then headed off to Sam's soccer game to get way too wet. Later that night Jamie went to work and to meet Pat at Steelhead. The kids watched a movie and then proceeded to try to trap me and tie me up in the basement. Today Jamie whipped up Dutch babies in the oven, which Sam had forgotten he didn't like the last time around. Everyone loved them so much that we all had seconds (or fourths in my case). The day was leisurely, with a trip to Hendrick's Park, a bit of shopping, and a walk over to Grandma Sue's to deliver soup. It's days like this that make it all worthwhile. 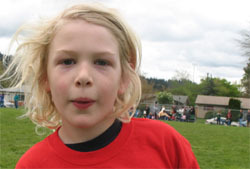 Sam had his soccer game this Saturday. He was a little disappointed that he only got to play forward for less than a minute the entire game. Still, he had a good enough time spreading mud on his face and running around in the rain. For whatever reason, Sam's rediscovered Legos. This morning he came down while the girls were sleeping in. We started building vehicles and other assorted gizmos. Throughout the day he worked on and off to create a bridge over lava, complete with bubbles popping out from the surface. It was rather clever. He continues to read like a fiend. He'll probably finish up his current Harry Potter book and start in on Order of the Phoenix next week. It's pretty cool. Mocha Friday, and a busy morning to boot. Last night was Sam's soccer practice. Emma spent the entire time catching tadpoles again, bringing them home to dump in our little porch pond. Sam's coach went bonkers and kept the kids way past the end of practice. After twenty minutes, I grabbed him and we headed home. Emma had a touch of a cold yesterday, so Jamie kept her home. Sam brought home his homework, which was nearly perfect and often quite funny. It was fun helping him do his first post on this site this week. My boy's growing up. We have swimming tonight and a game on Saturday. Busy, busy. Emma while Jamie had a few minutes to get her laundry done. Right now I`m typing about typing about typing. So I played line rider a lot today. I made a track where the line rider went into space, fell back down, and went through the earth. Wednesday already. I got myself a medicinal mocha this morning as I was feeling a little under the weather. Jamie reported that she was feeling a little feverish, and I suppose it got passed to me. In any case, I feel fine now, if a little tired. Emma came to visit me at work on Monday, which was a rare treat. We wandered about, looking at my cubicle and finding cool places in the hospital. She was extremely polite and even sweeter than normal. Tuesday night was Sam's soccer game. He played incredibly well, scoring one of the three goals of the evening. It was also pouring rain, making everyone quite soggy. What was really strange is that he didn't want to go, getting a little frustrated with a Wii game he was playing. All-in-all, things are doing fairly well. Emma and I seemed to spend a lot of time together over this last weekend. My favorite thing we did together was making whole wheat bread together. She's my little helper in the kitchen and is quite fond of pouring in ingredients and mixing them up. With bread, putting flour on your hands is a must, though perhaps she takes the instructions a little too seriously. Needless to say, flour was everywhere at the end of the process. It's the other little things I remember. We got the mail and critiqued the catalog of kid stuff together. 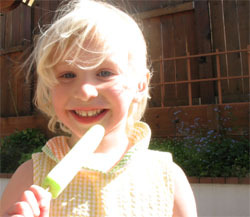 Emma ate a popsicle on the patio in the sun. She showed off her climbing skills at the park while Sam played soccer. It was actually fun watching Sam's soccer game over the weekend. In the past, it's been a fairly disorganized group of kids running about. My goal for Sam last year was to remain upright, as he seemed to constantly fall over for no good reason. On Saturday he did quite well, chasing the ball about and holding his own. No goals, which is fine with me. Sam was also looking pretty beat towards the end of the game. If he had fun and got lots of exercise, that's my main goal. School continues to go well for him. He blazes through his math homework without any trouble. He's similarly good at spelling, which he attributes to all the reading he does. I think he's on the fifth Harry Potter book and typically finishing a chapter each night. The weekend has come and gone. It was rather pleasant on the whole. Friday night the kids and I went swimming. Sam's a pretty good swimmer at this point, doing laps across the long end of the pool. Emma's okay, other than that pesky "breathing" thing. At one point she went in without catching her breath, swallowing and then throwing up some water. Poor kid. On Saturday Sam had a soccer game, so Emma and I watched him play. He did remarkably well, as did his whole team, and ended up pretty exhausted at the end of the day. Later on we had the Musgroves over and the assorted kids played together. 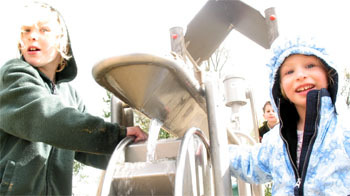 Sunday I took the kids to the park, where they got exceptionally wet and sandy. Then it was Humble Bagel for lunch, home for movies, and puttering around for the rest of the day. Emma and I made some great whole wheat bread. Jamie and Emma made a little wildflower garden in front. Later in the day we went for a family walk around the block, a pleasant end to a fine weekend. Mocha Friday. I just downed the delicious treat and have switched over to carrots. There's no comparison. 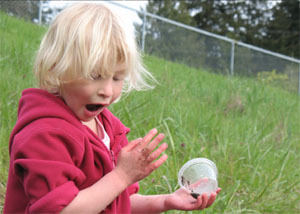 Well, at the risk of turning this site into an "Emma the Naturalist" blog, yet again I watched Emma catch tadpoles during Sam's soccer practice last night. She's got that Miller/Mellor obsessive behavior for sure, tromping through the mud to scoop them up and cheerfully show them off to me. She was quite a big girl, going up and down the muddy banks. Of course, she did slip a few times and we spent the last twenty minutes of practice in the car. I stripped off her jacket and pants, wrapped her in a blanket, and we listened to the radio and watched Sam play. The weekend is creeping right up on us, as is Sam's first soccer game. I'm hoping to go swimming too, sometime. Maybe tonight. The week keeps on moving on. It's a dreary sort of day today, and Seraph's cake is starting to run out. I shall miss it. Last night Dave and Kirsten watched the kids while Jamie and I continued watching BBC's Coupling. It's hysterically funny and I wish we had more time to watch. I remember back in the day when we'd watch a couple episodes of Twin Peaks each night when we were first going out. Ah, those were the days. 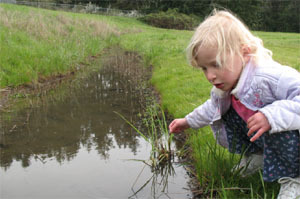 Tonight is Sam's soccer practice, and it's likely I'll spend the evening watching Emma catch tadpoles. Such is the way of fatherhood. Here is the Easter meal we had, which is now only scraps of salmon Kulebakha leftovers and way too many deviled eggs! Sam continues to play the traditional video games, such as Tomb Raider, but lately I've turned him on to the classics. Yesterday I had him playing Wishbringer, a classic text adventure that I played when I was a kid. He's a pretty good reader and he's just learning how to type, so it's a perfect time for him. I also put the game in a special "educational" category that doesn't count against his computer time limit. It's been fun watching him giggle as different things happen in the game, like the cute poodle turning into a hellhound. I heard him exclaim "Hey, I'm getting good at this" as his typing skills noticeably improved. During dinner I talked about how this was what computer games were like before there were graphics. I have these nostalgic feelings about the old text adventure games, learning to type and spell things like "gazebo". You can even play it online, though you can't save. Easter Sunday has come and gone, my mother's house filled with the smell of cooking and dozens of people crammed into her living room. The kids had fun playing with their cousins and I had a great time chatting with my sisters. Monday was a little weird at work, with things being so busy that I didn't eat lunch until 2:30 pm. Dinner was tasty, with Jamie making mushroom soup and rice pudding for dinner. If she ever goes back to work full time, my tummy will cry. While it snowed on Easter, the house was warmed by the smokey heat of frying perogies and blinys and cooking kulebakha, and the warmth of friends. I did call Seraph in desperation on Saturday, having somehow ruined all of my beet-dyed eggs. She had many helpful suggestions, among them to find the beauty in imperfection. So here is one of them- Dorothy should recognize the lovely plate from this Christmas! However, the good food and company made me miss home all the more. I can't wait to visit in early June! It's Easter Sunday and the kids are having a great time playing together this morning. They had fun with their Easter egg hunting. Emma in particular has been waiting a long time for the festivities to begin. Saturday was fairly low key. In the morning we went shopping and snacked at Humble Bagel. Later Emma and I went for a long walk to Flicks and Picks. It was quite the workout for me, walking for nearly an hour with Emma in a back pack. Fortunately she was great company and very chatty. As for today, we're waiting for Isa to come over and I'll take them over to the park to play. Later in the day we'll go to my mom's for a grand Easter dinner. It's Mocha Friday, though I still have another hour until that delicious elixir is mine. I had a funny situation at work where I got the final specifications for a project on Wednesday, started work yesterday, and learned they want guarantees that it'll be completed in four days. Silly customers. Last night was yet another soccer/tadpole evening. This time we took tadpole catching gear and scooped up quite a few. Towards the end, she became quite adept at catching them with her hands. I don't particularly mind muddy little girls, and by the end of the evening Emma was certainly doing her part. We scrubbed her squeaky clean just in time for dinner. As for this weekend, it's Easter festivities galore. Tomorrow is painting eggs and then Sunday is the huge family gathering. Fortunately it's also Russian Orthodox Easter, so there'll be vodka. Sam's had a somewhat exciting week, all around. It's back to school, which he seems to enjoy quite a bit. As usual, he's doing very well at his studies, and enjoys hanging out with his friends. It's also the start of soccer. I was worried he wouldn't enjoy it, but he seems to be having a fairly good time. As he explained to me last night, there's a lot of things he likes about soccer, just not the game itself. He likes the exercise and visiting with friends, which is fine with me. Sam also completed the grand treasure hunt that Sadie sent him on. For months he's been getting letters and packages with mysterious clues. We finally got a mysterious package with a massive glass diamond inside. He raptly listened to CDs that told of clues, which he assembled and found. It was extremely cool and Sadie did a great job. It's soccer season again. Sam was running about with his friends tonight, while Emma busied herself poking at tadpoles with a stick. 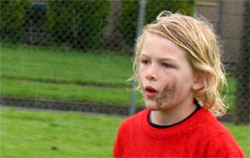 The lure of a muddy ditch was quite strong, though Sam resisted unlike some of the other soccer players. The week has been going well so far. Work has been busy, but also kind of cool. I've been redoing an old application with our new stuff, and I'm excited to wow the customer with it. Jamie tried hard not to do anything today, her first few hours of not watching kids in nearly two weeks. When I got home today, Sam was proudly showing off a massive jewel. Sadie has been putting him through a grand treasure hunt and I suspect this was the pinnacle. He's also been playing the latest Tomb Raider game, so he's primed for treasure seeking these days. 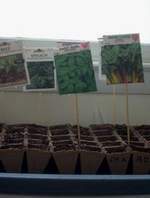 It is nearly warm in Western Massachusetts, and I started seedlings for vegetables this weekend. Work is swinging along, and I had a great time at the Idealist Conference last weekend. My friends and I are planning a three day Easter feast, with the final day featuring Russian delights! The family's back. They arrived Saturday afternoon, with me eagerly running outside to the car, only to find that Sam was eagerly running inside to find me. Everyone was pretty tired from their car ride, especially Jamie. The kids and I put in a lot of play time and taking it easy. On Sunday, I took the kids out to Amazon park to catch bugs in the swamp. After I cleaned up most of the mud, we went to Humble Bagel where Sam put away a ton of food. We spent most of the afternoon at home. Sam did a great job making treasure hunts for Emma and I. In the evening, we all went out to Ambrosia, where Emma wowed the other diners with her Barbie princess shoes. All is well again in the Miller-Mellor household. The kids go back to school tomorrow, having a final day of rest. Soccer starts tomorrow, so I'll probably be running about outside with Emma quite a bit in the weeks to come.